GROWN IN THE USA! Low and slow...the only way to ferment a Pennsylvania Broadleaf to taste like ours. If you like a full bodied, medium-strong cigar with an incredible taste, you must try Green. She's a beauty that does the Pennsylvania cigar history proud. Just look at the depth of the marbling. It is fantastic! A triple Ligero (Piloto Cubano, Olor Dominicano, and Nicaragua) wrapped in the most beautiful PA Broadleaf you will find. The Binder is a Habano (Cuban seed) grown in the Dominican Republic. A Full bodied cigar that is medium to strong. 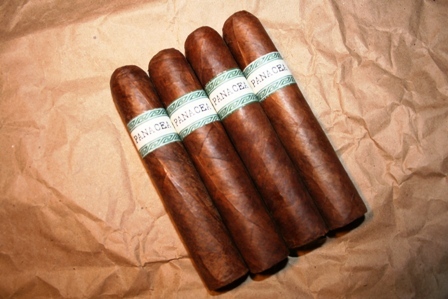 Try a pack of 4: Grande 560 (5x60). Everything a cigar should be. A fat, hefty, delicious, flavorful smoke. It's a medium to full-bodied cigar with a perfect wrapper. The draw is light and easy - burning evenly and very cool to the band. This is a very fine, beautifully-crafted cigar that easily stands-up among the best of the connoisseur brands. Very special. A completely enjoyable fine experience. I love the size of these cigars. They are tightly rolled and great tasting. a perfect smoke! Very good construction, well wrapped and tight with a little give with a pinch. Nice tight cap that cut well with a punch. Lit well and only needed a few minor corrections during the smoke. The 560 burned extremely cool, and held ash a little under a inch. The first half was full and deep. Strong coffee flavor that didnt linger after the draw. Second half eased up heavy and it became a quite milder smoke. Still wonderful flavor with very heavy thick smoke.